Perhaps you’ve experienced the joy that comes from feeling compassion for yourself or others, or the bliss of knowing yourself to be part of the great oneness, or simply the peace and contentment of living just in this moment – only to fall off the beam. I know that happens to me. Gradually – or sometimes suddenly – I fall from grace and find myself mired down once again in the pain of the old non-satisfying habits – criticism of self and others, doubt and fear. I know that expansion and contraction are a natural cycle in all of nature – breathing in and breathing out, the endless progression of the tides, the phases of the moon. Expansion and contraction are an inevitable part of being human. I still hate the pain of contraction and wish that somehow I could bypass that part. Why can’t I just stay expanded in bliss all the time? In this week’s Inner Wisdom Circle the dynamic of expansion and contraction came up in the initial sharing, so we decided to explore it through imagery. 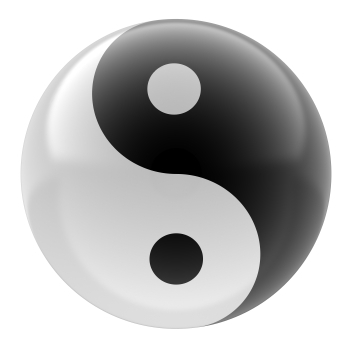 One person’s imagery showed how expansion and contraction are simply two parts of a whole, much like the yin/yang symbol. She saw the two of them rolling around playfully with each other. They showed her how necessary contraction is for gathering in the expansive experience and making it a part of who you are. We were all surprised when another person’s Guide – a Turtle – closed itself up tight in its shell to show what expansion looks like. Turtle explained that you are most open to your own inner awareness – the ultimate source of expansion – when you shut out external distractions. It’s only when you come out and need to deal with the demands of the external environment that the impulse to contract arises. Then an Eagle showed how the greatest expansion of all comes when you fly high above, taking it all in. Next time I find myself in contraction, I’ll turn to these gifts of fresh perspective to help me through. I hope you do, too! Hi – Somehow I missed that you had written a book called The Personal Totem Pole ! Wow! I liked what I read in the email that came. Also liked the visual yin/yang with what was said. Wonderful allegories bringing such wisdom and ease of understanding.